In the 20th century, intellectuals devoted lots of energy to analyzing lens-based narrative visuals (photography and cinema) and modern non-figurative art. Animation, graphic design, typography, information design, and other areas of visual culture were mostly ignored. in fact, if you are to search for books which theoretically analyze graphics, you will find only a single title published in France in the end of 1960s: Jacques Bertin, Semiology of Graphics (English edition, 1983). In the 1990s, most areas of culture industry switched to software-based production. As a result, graphic design (as well as as other areas of visual culture I listed above) assumed much more central position in contemporary culture. Additionally, visual culture became hybrid. Today, a still design or a moving image sequence now typically combine many previously separate media. Such hybrids are now the norm. Cultural Analytics approach can be used to analyze motion graphics (as well as other areas of contemporary visual culture largely ignored by academic theory.) The analysis and visualization of how different image parameters change over time allows us to describe moving images in new ways . We can graph temporal patterns, and compare them across different films. Below are some the results of our explorations into different ways of visualizing temporal changes in motion graphics. A comparative matrix: four works + different analytical graphs. Mapping visual parameters in video for “Go." Mapping visual parameters in video for “Go": detailed analysis of the first 30 sec. Temporal analysis of video for "Go" by Common. 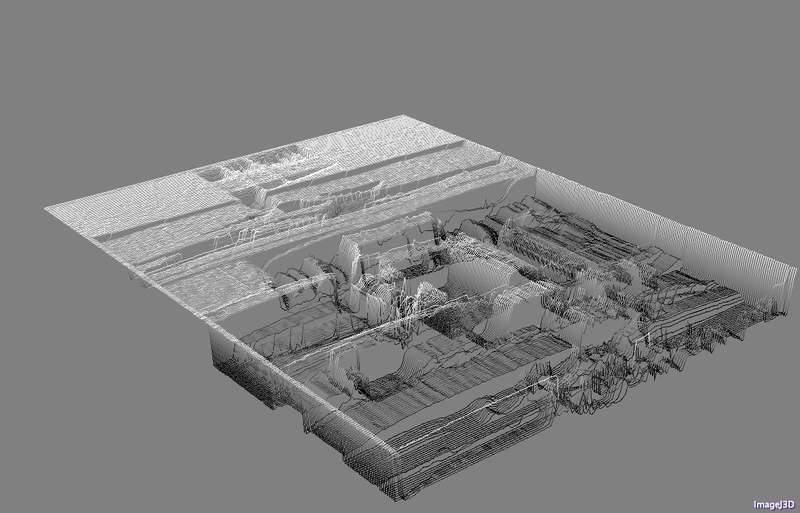 Grayscale profiles (mapped into a 3D (first 32 seconds of the video only). Björk's music video: a set of sampled frames. Temporal analysis of Björk's music video (sampled at 15fps). Each horizontal line corresponds to a separate frame of video (sampled at 4fps). The program draws a horizontal line through the middle of each frame, and copies the colors into a row of a new image. Temporal analysis of Björk's music video. Each vertical line corresponds to a separate frame of video (sampled at 15fps). The value represented is a median of a frame. The same data mapped into two values to represent the rhythm of changes between figurative parts (dark brown) and abstract part (light brown).